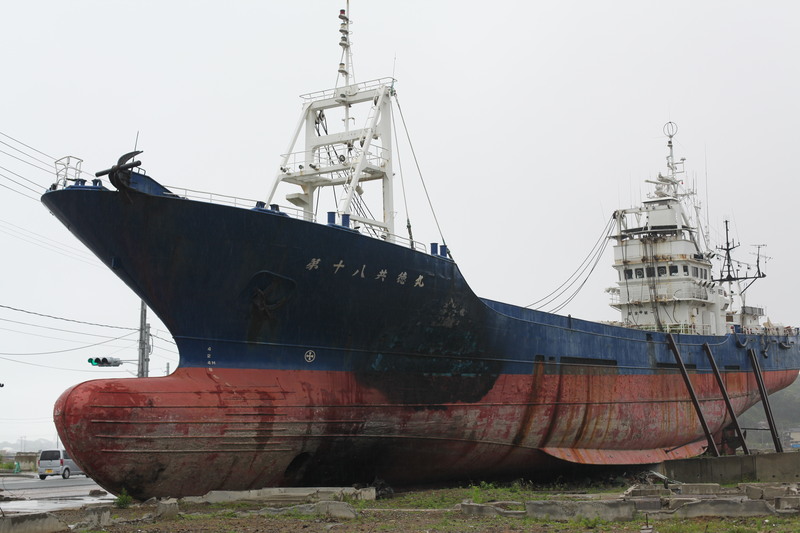 So the fate of the vast ship, Kyotokumaru, has eventually been decided by the people of Kesennuma. It is to be destroyed. It seems right somehow that this incredible hulk of metal, which stands as testament in some ways to the phenomenal natural disaster and loss of life should go. But what seems more right to me is that the people of the city decided by voting. It is a gigantic focal point, to channel the feelings and shock erupting from the event, it is a monument for what was left behind, for what had literally and metaphorically been shifted, for those of us too far away to see the affects for ourselves or to really feel them affect our daily lives. And for visitors, pilgrims to the city. The image of the ship, along with video of the sea so slowly, but too quickly creeping in and then churning up buildings and streets and homes and cars and trees and people, are for me the iconic images of the disaster. And one of the images that stayed with Matt after he had visited the region, was the ship, which of course was in our minds as inspiration in part for our project. Not having visited the ship, seeing photos and film, it reminds me of the site of 9/11, after the Twin Towers had fallen, and the few massive forks of metal, like a gothic castle ruin or gigantic mangled crowns remain. It is Dorothy’s house from The Wizard Of Oz, lifted up by a tornado and landed somewhere else, where nothing is as it was before. The dam broke and then the sink drained and this is how things were left. Internal organs rearranged, sand banked, left high and now dry, sucked up, spat out and then gone. So how do we put our boat Eight Prosper Circle to bed? How shall she be retired? We are used to making complex work, that is sometimes difficult to achieve, but we are not used to making such a huge physical piece – that you make, leave behind and know you will never see it again. It is loss, a feeling of premature bereavement, which often happens after making work. There is a massive surge of energy, sometimes sustained over months and even years, with groups of people, a community gathered around an idea, then it is here and it is gone. In this work the effort and engagement and faith has literally been immense. Like the Daruma doll – you fill in one eye at the start of a project, make a wish for something to be completed successfully and when it is, you fill in the second eye, burn it at a shrine and say your thanks and goodbye. Do we take this approach, fill in the second eye with a pen, burn it and that was that, or do we crush it as small as it can go and put the waste into a dump somewhere? Or do we break it into its’ component materials and recycle it as best as we can? I had hoped that someone could use it, take it, have it – for whatever they want it for – I would rather this, I would rather all those materials and all that work in the making of the ship lives on. I guess I don’t want it to die, her life doesn’t seem over to me yet. Knowing when something is done and how to end it appropriately, that is the task at hand. A lot of this is outside of my control, but within my trust. Now she is entrusted to others for a suitable removal. I will not see her go, I will hear about it, read about it, maybe we can make some film or photos of it, I will draw and write about her transition – if I can I will try to persuade Aoki or Taka to do this for me, if they get on site of wherever it is that she will be destroyed. And a giant whole will remain. 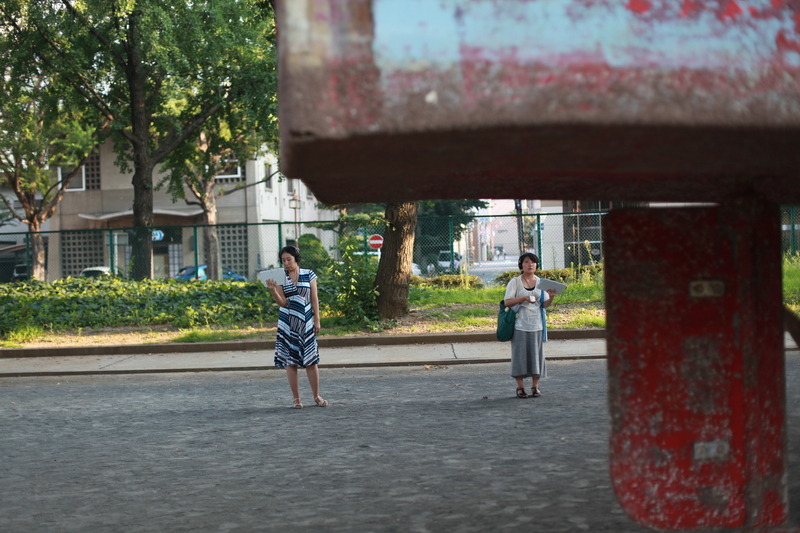 Yasunori will send us her name painted in wood and some of her significant parts – we are thinking if there is something else to say or show here. Of course there is the film let’s not forget which tells the whole story and which you can watch when you visit the boat in the park. 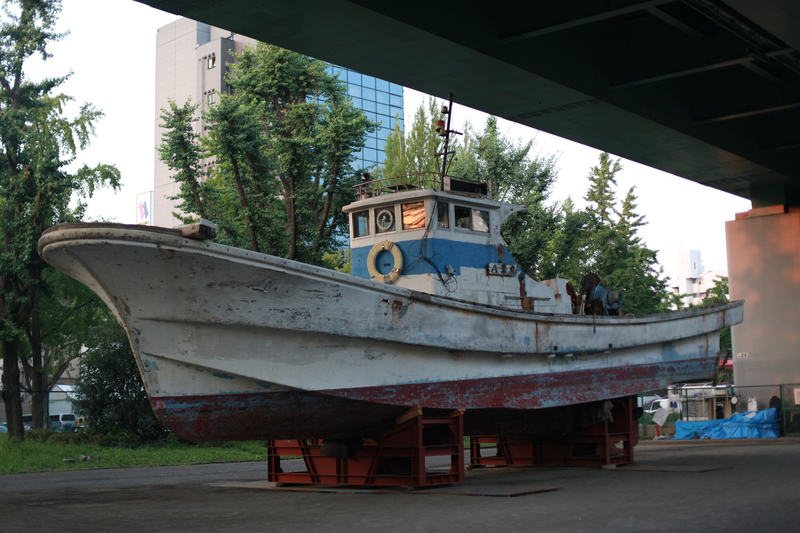 This is arguably the work itself, the boat as a very large protagonist, in the film, which so far has been seen by over 1700 people. And then there are the people, a few who we knew before, a lot who we never knew before, some of who are now friends and all who are very dear to us. I’ve never been so sentimental about a piece of work before in this way, our work is ethereal, temporal,conversations and stories, mostly without physical structures, built in the air, sets of experiences that you can feel, that don’t manifest themselves this way, until now that is. Of course there are traces and offshoots that stay around in different physical manifestations of our other work, but nothing quite like this. And if you know anyone in Japan, ideally Nagoya or Aichi who would make a good home for her let me know urgently, as it’s not too late yet. She has had a few loving owners and a lot of lovers.